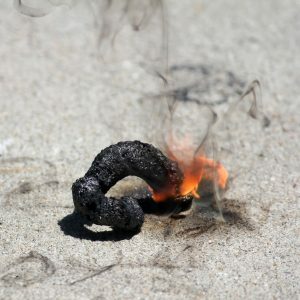 Black snake fireworks are small, non-exploding fireworks that you ignite to push out a growing column of black ash. While you can buy these fireworks, they are easy to make using kitchen ingredients and a fuel. Mix together the sugar and baking soda. Make a depression in sand or dirt, pour the mixture into the depression, and lightly cover it with a fine layer of sand. You could just use sugar and baking soda in a bowl, but it makes for a cool effect where the snake seems to push out of the ground! Dampen the soil and mixture with lighter fluid or rubbing alcohol. Light the fuel with a match or lighter. Once the sugar in the underlying mixture catches fire, the black snake will start to grow. The firework goes out on its own, but you can extinguish it with water or by covering it with dirt.